"A single photo - no words - capturing a moment from the week. A simple, special, extraordinary moment. A moment I want to pause, savor and remember." via Soulemama. 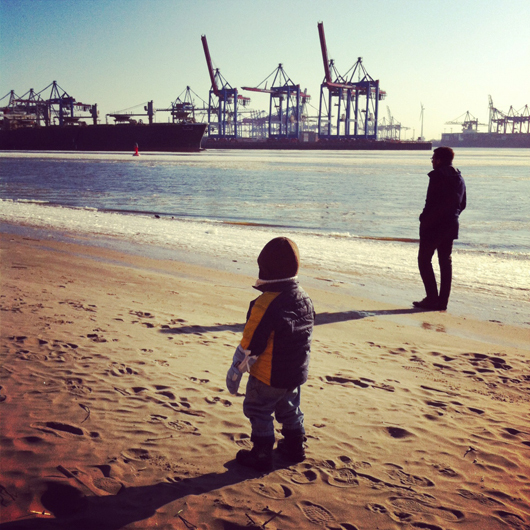 ohhhh I miss Hamburg so much! What a lovely moment! Oh, I adore the beach in the winter! I hope you have a lovely weekend Sylvia. I love how they both seem to be so engrossed in their thoughts. Great moment, Sylvia. Just love the ocean in the winter! Beautiful photo and it looks kind of chilly!! Lovely. I love the beach in off season, there is such a peace about it. Looks like a beautiful day. Who ever said the beach is a summer thing? Such a contemplative moment. You can just feel the peacefulness of this moment! Our moment this week is a creative one. The girls have been taking this wonderful art class (held in an old schoolhouse!) for the last few weeks! Everything about this place is magical and it's easily the highlight of the week! It's nice to meet you "the ants" -- what a lovely blog filled with light and creativity! Great atmosphere in this moment, does look a bit chilly though but isn't that all part of the charm of the beach? :) Happy Weekend to you. sea + winter = divine. This is breathtaking. Makes me ache for the ocean. I love the lined up shadows! ooh, sehnsucht (sharing kimmy's sentiments)! what a wonderful, dreamy moment! love the color spectrum. The beach in the winter...so fresh and alive! Hello Simona and Sylvia, I’ve nominated you for the Verstile Blogger Award, feel free to visit me and collect!